It was the sort of invitation that causes both excitement and trepidation, an invite to visit the autonomous mountain enclave in northern Iraq known as Kurdistan to carry out field research. It was exciting because we were being given an "inside track" to a moderate sanctuary inhabited by a pro-American Muslim people known as the Kurds, but frightening for the fact that this sliver of land they inhabited abutted the expanding ISIS Caliphate which threatened them every day. Tens of thousands of legendary Peshmergas (i.e. "Those who Face Death," a volunteer Kurdish fighting force that had fought Iraqi dictator Saddam Hussein to create this autonomous zone) manned a thin defensive line stretching 650 miles along Kurdistan's tenuous border with the ISIS state based in nearby Mosul and were under constant attack. But our Kurdish hosts, Diyar Jamil and Abdulkarim Karim, assured us that life in this fragile enclave was normal and even peaceful, despite the daily assaults on the Peshmerga front line by fanatical ISIS fighters. In this mountain refuge for the Kurds, an ancient Aryan people related to the Persians, life went on and we were promised the opportunity to safely travel the length and breadth of a beautiful land that few outsiders get the chance to visit. Ignoring the gloom-and-doom U.S. State Department travel advisories which seemed to apply more to the rest of Iraq proper, which was inhabited by Arabs, my travel companion from a previous trip to visit the pagan Kalash descendants of Alexander the Great in the remote mountains of Pakistan, Professor Adam Sulkowski, and I set out to visit the front line of the war on the ISIS terrorists in January 2016. What we saw in Kurdistan gave us cause for hope not only for the Kurds, the largest nation in the world without their own internationally recognized state, but for the greater Middle East. "No Friends but the Mountains." The Kurds are victims of history. When the Ottoman Empire disintegrated after World War I, they were not given their own state like the Arabs and Turks were. Instead, the victorious British and French divided them up amongst Iraq, Syria, Turkey and Iran. Those Kurds living in northern Iraq fought for decades for independence from this Arab-dominated state and suffered a genocidal assault from Saddam Hussein in the 1980s that saw 182,000 of their people massacred. The long-suffering Kurds of Iraq were largely ignored by the international community and, to this day, have a saying "We have no friends but the mountains" that captures their sense of isolation. Their chance for freedom from oppression and opportunity to construct autonomy came with the overthrow of Hussein in the 2003 U.S. invasion of Iraq. Since then, the Kurds have built a de facto state complete with its own flag, army, democratic government, and an industry based largely on oil. When we arrived in the Kurdistani capital of Erbil, located at the foot of the Zagros Mountains, we found a boomtown that had everything from KFCs (Krispy Fried Chicken, a local imitation of the American chain) to modern universities and newly-built skyscrapers. Our goal was not, however, to stay in the capital, which had been temporarily evacuated in 2014 when ISIS conquered Mosul (a mere 50 miles away) and threatened to overwhelm Kurdistan. Our main intention was to see the surrounding countryside. With the skilled Karim driving us deep into the snow-capped mountains, we explored this terrain that was as beautiful as any landscape I had seen in Switzerland or the Himalayas. 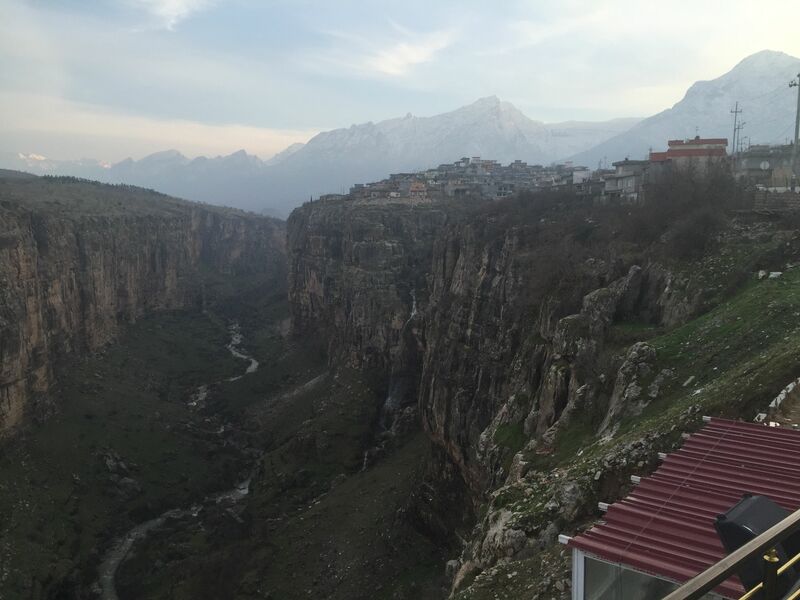 The gem of the mountains was Rawanduz, a scenic village precariously perched above the deepest canyon in the Middle East. Standing on the rim of the canyon, watching a waterfall cascade down the side of the green valley walls with snow-capped mountains surrounding us, we felt as if we were in a veritable Shangri La. Our journey ultimately took us from near the Iranian border down to the scenic valley of Lailish which overlooked the plain of Gaugamela where Alexander the Great defeated the Persian King of Kings Darius in the 300s B.C. In Lailish, we found the holiest shrine in the world for the Yazidis, a long-persecuted pagan people who adhere to a syncretic faith that combines the ancient beliefs of Mesopotamia with the worship of angels, such as Melek Taus, the Peacock Angel. Deep in the passageways of their stone enclosure built in the mists of time, we watched Yazidi worshippers tie knots in scarves hanging from fire-blackened pillars and make wishes. The Yazidis believe that when the scarves are untied by other believers their wishes come true. We also visited the grave of Sheikh Adi, a miracle-performing Yazidi saint who was buried in the site roughly 900 years earlier. Tragically, the ISIS fanatics had conquered the Yazidis' second most important holy spot known as Mount Sinjar in August 2014 and destroyed their ancient shrine there, enslaved their women, and killed their men as "devil worshippers." 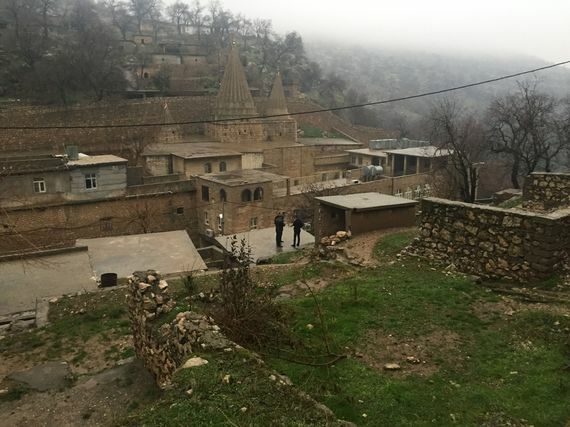 The second highest ranked priest of the Yazidi faith, Baba Chawish, explained to us that his people's religion was nonviolent and his small people did not have a tradition of defending themselves. 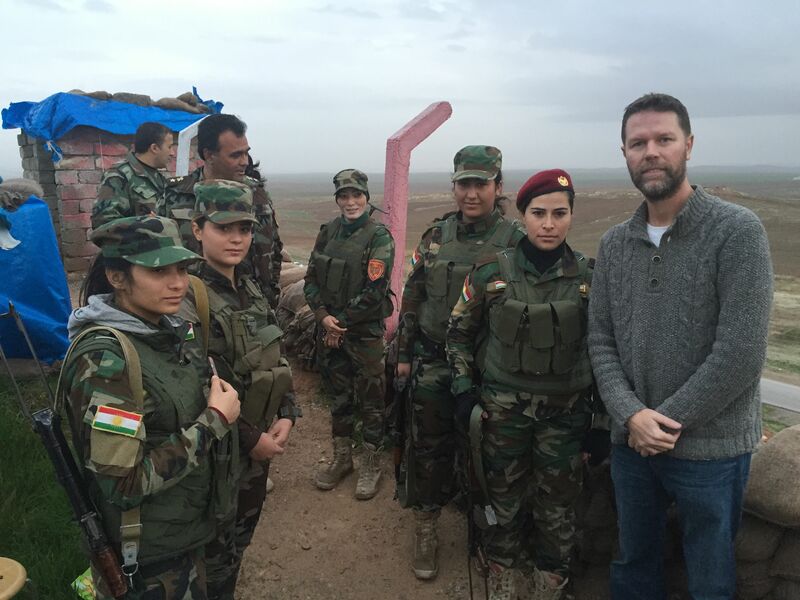 Fortunately, the Kurdish Peshmerga, working with the U.S. Air Force, had liberated their shrine in Mount Sinjar a few weeks before our visit and many Yazidi refugees were returning to their homes to the west. But this small return movement of Yazidis was a drop in the bucket of the approximately two million refugees that Kurdistan, a land of just five million people, has given sanctuary to. The Kurdistan Regional Government proudly offered refuge to hundreds of thousands of Arabs, despite the bad blood between their peoples (the U.S. by contrast has only accepted 2,000 Syrian refugees). We visited a sprawling camp for thousands of Syrian refugees near the Syrian border and our hearts were touched by the sense of pride and hospitality these displaced people, who had experienced unimaginable horrors, displayed. One Syrian woman showed us around the bare, concrete hut that provided shelter for her and her four children and jokingly told us that she would love to bite ISIS fighters if she had the chance. 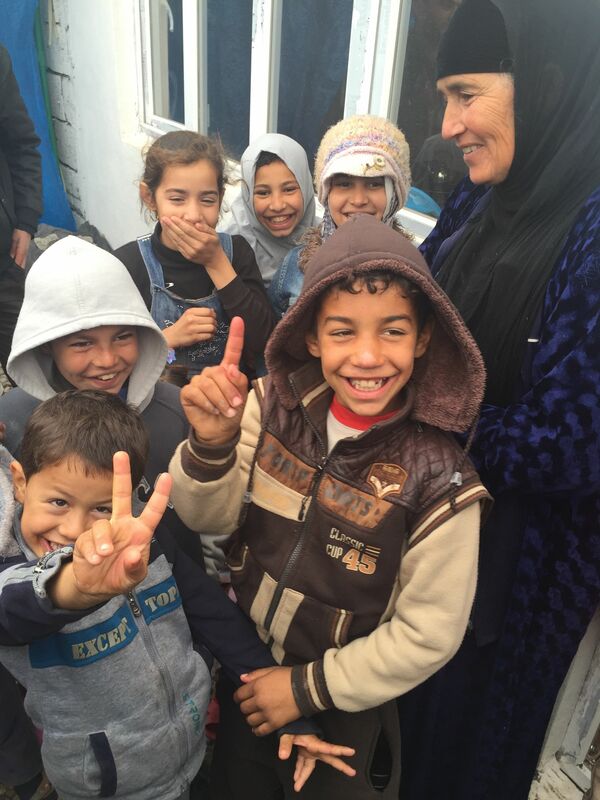 When Adam asked her beaming children what they dreamed of being when they grew up, they responded that their only dream was to return home. All the refugees we met were grateful for the protection that the Peshmergas offered them and we decided to visit these famed fighters who were the most effective fighting force against ISIS. Our dream in particular was to meet the legendary female Peshmergas who had made headlines across the globe in 2015 when they played a key role in the rout of ISIS in their first setback during the siege of the Kurdish town of Kobane. It was with great trepidation that we traveled to the front lines near Mosul to a hilltop command outpost facing ISIS known as Base Rosh (Sun). There, we met General Bandal Bande who warmly greeted us and half jokingly told us that Kurdistan wished to be "America's 51st state." He told us that his war-weary troops were constantly low on ammunition, that they were in daily clashes with ISIS who killed his fighters with I.E.D. explosives or sniper rifles, and that the enemy had heavier weapons than his own soldiers. But they were determined to protect their people's enclave and wanted Americans to know that they were fighting the enemy that threatened both peoples. After our discussion, General Bande led us to the sand-bagged walls of his exposed outpost and introduced us to a platoon of female Peshmergas. These camouflage-clad fighters armed with assault rifles appeared to be young and the beauty of many of them seemed to belay their fierce reputation. But their commanding general assured us that these warriors were the bane of the ISIS fighters and had repulsed many an assault. Seeing these female soldiers boldly manning the front line with an enemy that had created something akin to ISISphobia among distant Americans, I realized they stood for everything the misogynistic terrorists hated. Whereas ISIS wanted to drive women back to the stone ages, these women were fighting for the future of their nation and its principles of pluralism, equality, and moderation. 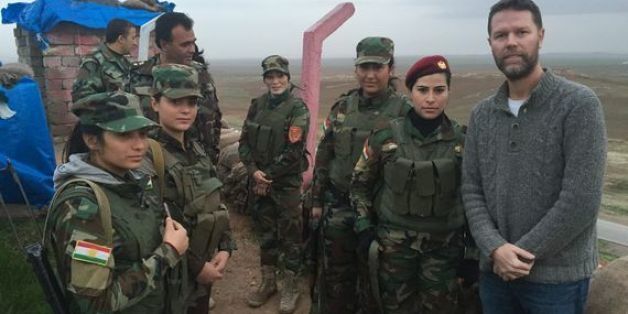 As we left the exposed base with an undisguised sense of relief, my heart went out to these brave female Peshmergas who always left one bullet in their weapons to kill themselves should they be overrun by the ISIS fanatics. Our next visit was to a man who waged a different kind of war against ISIS terrorists trying to infiltrate Kurdistan, Masrour Barzani. Barzani was the son of the Kurdistan Regional Government president and served as the Chancellor of the Kurdistan Security Council. He invited us to his heavily-guarded, hilltop headquarters overlooking the capital and spoke with us about his efforts to disrupt ISIS sleeper cells trying to carry out terror attacks in his relatively peaceful land. 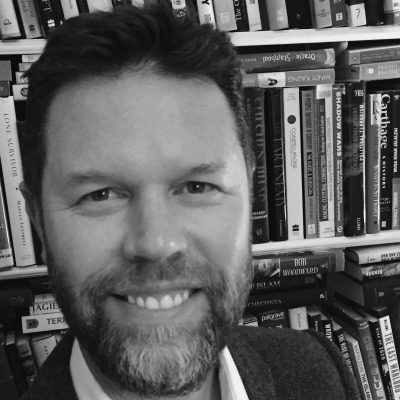 Thus far, his agents had been incredibly successful in disrupting ISIS plots and Kurdistan had only experienced one major terror attack, even as the rest of Iraq and neighboring Syria descended into chaos. When combined with the ubiquitous Peshmerga checkpoints that are found every few miles on Kurdistan's roads, Chancellor Barzani's security apparatus created a sense of security that made us feel as safe in his lands, if not safer, than in our hometown of Boston. Our final visit was to the man who shaped Kurdistan's foreign policy in this dangerous neighborhood, the Kurdistan Foreign Minister Falah Mustafa Bakir. He explained to us that the Iraqi government had cut Kurdistan off from its payroll in 2014 to punish it for directly selling its oil to Turkey. When combined with the collapse in oil prices worldwide and flight of foreigners who had been working in Kurdistan due to the ISIS conquests, the freezing of Kurdistan's share of the national budget had led to an economic collapse. As a result, no government employees were being paid and even the legendary Peshmerga were now fighting without receiving salaries. But Mr. Bakir summed up the situation with the sort of optimism I found throughout this de facto country "We have survived worse and we will survive this. At least now our oil is not being used by the Iraqi government to carry out genocide against our people." It was only later, after we said a fond goodbye to our travel companions Karim and Diyar--who had proudly shown us their homeland and refused to let us pay for anything from meals to the gas that fueled our daily journeys--and we flew back to Istanbul, Turkey, that were able to make sense of everything we had seen in this scenic land. In Kurdistan we had found a moderate people that protected pagans and ancient Christian minorities (we also met the Bishop of Dohuk who spoke highly of the Kurds' sense of inclusiveness for Christians), empowered women, were democratic, and were actively fighting ISIS at a time when many in America were asking where the moderate Muslims were in the war on terror. But the greatest lesson we learned from our journey among this welcoming people was that, in a time when some American politicians seek to tar whole religions in broad brushstrokes, Islam is not a monolith, it is a mosaic. And, as the case of Kurdistan vividly demonstrates, some of our greatest allies in the war on terrorist groups like ISIS are themselves Muslim. For further photographs from my journey to Kurdistan, including rare photos inside the Yazidi temple at Lailish and pictures of the female Peshmergas, see here.